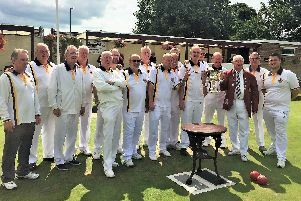 Southsea Waverley retained their Portsmouth & District League division one title with a 25-shot victory over Rowner, writes Dave Wildman. Gary Starks’ rink led the way with a superb 15-shot success. Defeat for Rowner meant they joined Bedhampton in being relegated. Having recovered from their mid-season slump, Alexandra notched back-to-back home wins to move into second spot. Big wins on the rinks of Barry Harman and Carl Baggott saw them beat Leigh Park by 38. Baggott’s quartet then registered a crucial 27-shot success in a 21-shot win over closest challengers Lee-on-the-Solent. Lee, who still have a game in hand on Alexandra, had earlier lost at Waterlooville by two shots. The game swung in favour of the hosts when Richard Allen’s rink fought back to pick up five shots on the last two ends for a vital tie. Priory completed their season with home wins over Vospers and Leigh Park. The rinks of Nigel Mundy and Martin Eggleton starred in the former before Richard Smalley’s quartet led the way against Leigh Park. Fareham ended their campaign with a 23-shot defeat at relegated Bedhampton. In division two, Portsmouth Water sealed promotion with a 41-shot home win over Naismith. The size of victory was largely down to a 23-shot win on Pete Musson’s rink. However, they were unable to wrest the title from the grasp of Cowplain – after claiming only three of the four rinks in a 15-shot win over Milton Park. Cowplain had beaten Denmead by 72 – with Dave Powe’s rink claiming a 28-shot success. Purbrook Heath had to win their home match against Gosport to retain any hope of avoiding relegation. However, they fell to 62-shot defeat as Jim Oswell’s rink bagged a 22-shot win for Gosport. Purbrook joined Hayling Island in dropping into division three. Crofton survived despite going down by 17 shots at Milton. Steve Caine’s rink prevented a whitewash, while Mick Brown’s men led the way for Milton. Star had a 22-shot home win over bottom-club Hayling, with Simon Filippi’s quartet winning by 22. In other rearranged matches, Denmead ended their season with 37-shot home win over Star. The 35-shot victory by Brian Goldacre’s quartet was the key factor in their triumph. Hayling lost their final match by 19 shots at Naismith, with Mick Penny’s rink proving crucial. Crofton celebrated avoiding relegation by travelling to Purbrook Heath and winning by 11. Charlie Read’s quartet bagged a 12-shot success. In division three, leaders College Park secured the title in a 72-72 draw with Gas Social. Bridgemary fell to an 11-shot defeat at Pembroke Gardens, leaving them one point short of promotion with two games left. Pembroke’s win came courtesy of a 13-shot win on Dave Brookes’ rink. Earlier in the week, Pembroke had lost by two shots at Cosham Park despite winning on three rinks. Phoenix travelled to Emsworth and left with a 30-shot win, thanks to big victories on the rinks of John Timmins and George Russell.